Last month, during our UK weXplore, I took fourteen students to get fitted for kilts at the Highland House of Fraser in Inverness, Scotland. I must say, each time I plan an activity involving traditional dress I get a mixed bag of looks and reactions from my colleagues and students on whether donning cultural dress is acceptable or disrespectful. Hopefully through this blog I can clarify my opinions on the anthropological and educational value of wearing traditional dress while traveling. I see dressing in traditional garb as a way to show a genuine cultural appreciation for human diversity in the places we travel. By donning traditional clothing, we can express our humility and our interest in preserving and understanding the ways of the past. Wearing these garments helps us show our affinity for the local and indigenous people, and they allow both parties to collectively understand that our similarities outweigh our differences. In showing this cultural respect, however, we are often the recipients of giggles and stares. Most of the time these giggles are appreciative and the stares are out of cultural pride. As students and teachers traveling the world, we don’t have the natural grace of an Indian woman in her colorful sari nor the stature of a Maasai warrior cloaked in his bright red shuka, so it’s only natural to feel a bit ridiculous and out of place when slipping on these garments. By dressing like a local, though, you gain an understanding of the innate relationship they share with their environment. The materials used and the functionality of the outfit provide myriad clues in understanding the culture you find yourself immersed in. For example, the shuka of the Maasai was originally made of animal skins before a switch was made to a more practical cotton. The shuka’s red dye coloring is said to camouflage its wearer, helping them blend into the red clay earth that dominates the landscape. Below is a picture of a friend of mine, Silasi Lazar, wearing his shuka outside of a shop in Moshi, Tanzania. At the end of this visit, we exchanged his shuka for my hat. My hat was from the Quiksilver Pro Surfing Competition that took place in my hometown of Long Beach, NY. This was the item of clothing that I was most proud of about my home, and I felt it was the best I could do on short notice. We both received our gifts with schoolboy smiles. Donning the traditional garb also allows you to connect on a deeper level with the local people. Most times you will need their help in dressing correctly, and this conversation may be one of the best experiences you have. I remember in Bhutan, while wearing a traditional gho at the dzong in Phobjikha Valley, my student Yodsel explained to us his country’s elaborate scarf system. The color of each scarf represents a certain status, and the way you don it is important in conveying respect when greeting someone of a higher status. The white scarf that I am wearing below is worn by civil servants and commoners, orange scarves are for members of Parliament, and a yellow scarf is reserved for his Majesty, the King, and the Je Khenpo, Bhutan’s spiritual leader. Later, while applying the specific kneel and presentation of the scarf greeting, I was received warmly. In successfully performing the greeting, the Bhutanese elders recognized my genuine interest and respect for their customs. Let me clarify: when my students and I dress in traditional clothing, we are not talking about costumes. I agree with the 2011 Ohio University campaign “we’re a culture, not a costume” campaign in that costumes reinforce stereotypes. I am explaining the importance of traditional dress to foster cultural appreciation and understanding, not the opposite. Blogger Mabel Kwong wrote, “Stereotypes have a positive side in that they assist in sustaining cultural traditions. If we ignore stereotypes, we may lose sight of the significance and beauty of individual cultures.” (mabelkwong.com) There are many instances where a stereotype may be the only cultural export a people have. We deconstruct these stereotypes to better explain their cultural relevance and realities to others in my classes at THINK Global School. The discussion of costumes versus culture leads us to the complex concept of cultural appropriation. Simply put, cultural appropriation is the adoption of traits from one culture to another. Despite the inevitability of this occurring in our rapidly globalizing world and the current discourse on racial appropriation in the USA, we would be shortsighted to only see this as a negative phenomenon. In a recent piece for Unsettling America, Jarune Uqujaren explains the importance of mutual understanding and respect in fostering true cultural exchange. My goal is to use dress to understand and preserve cultural traditions. I would like my students to see the functionality of traditional dress and think critically about the functionality of fashion today (think iPhone holsters and wearable technology). This is quite different than having frat parties and themed dances that encourage mockery and costumes. While in India, I gained clarity in my understanding of cultural dress and its importance by wearing the kurta in Hyderabad and the turban in Amritsar. Colleagues Russell Cailey, Jarret Voytilla and I wore sherwani for both Ganesh Chaturthi and the Celebration of Teachers. Sherwani is the national dress of Pakistan, and its roots can be traced back to the Turkish and Persian nobles in the Delhi sultanate and Mughal empires. Indians typically wear sherwani on important family holidays, opting for kurtas, a simpler garment, during informal gatherings. We put on our formal sherwani for these events at the INDUS School in Hyderabad. We learned that bright colors in Indian dress were thought to be auspicious. This is why you see saris, sherwani and kurtas all possessing such a high degree of shimmer and shine. 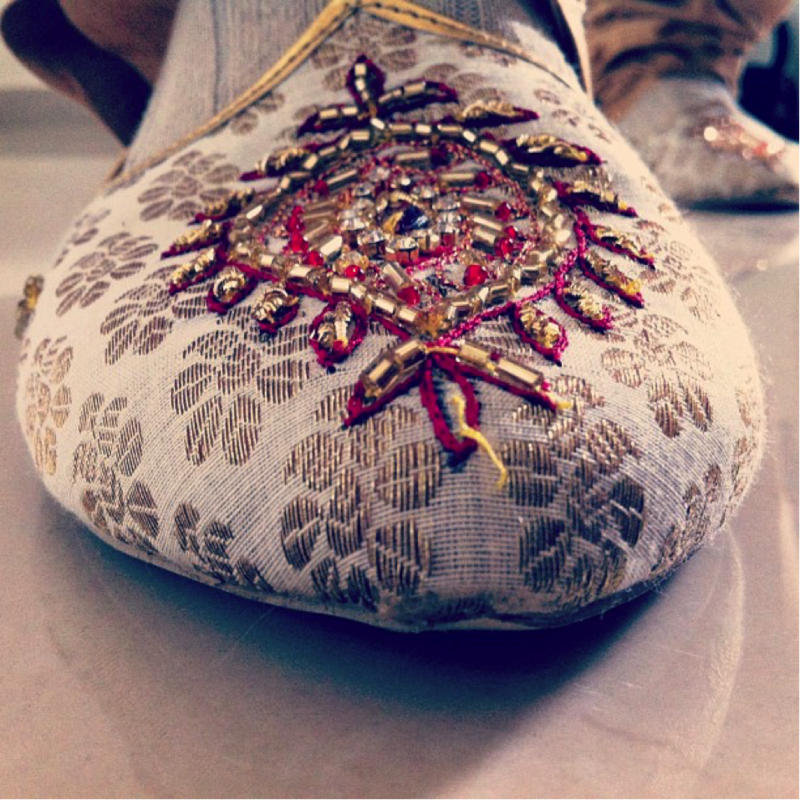 Sherwani shoe showing the dazzle. Photo by Lindsay Clark. While exploring the Punjab region of northern India, we learned about the 5 K’s of Sikhism. The 5 K’s of Sikhism are important articles of faith that every baptized Sikh should wear at all times. My students and I were lucky enough to be in Amritsar, at the Golden Temple, for the celebration of the birthday of Guru Granth. Wearing the turban to the Golden Temple for the celebration of Guru Granth’s birth. Photo by Nick Martino. One of the 5 K’s in Sikhism is kesh, the belief that the hair is a gift from God and should be in its natural state and never cut. The turban serves the function of keeping the Sikh’s long, natural hair under control. The turban is also a symbol of unity amongst Sikhs, and our local guide suggested that we wear turbans to the Guru Granth festival to show our respect. He spent an hour getting them on us while explaining their meaning. Humanity shined in the streets of Amritsar during the festival, and that evening remains one of the most memorable travel experiences of my life. I chose to end this blog with the turban because I think it is one of the most misunderstood pieces of clothing of our time. In the United States, I feel that most people see turbans and associate them with Islam, which leads to generalizations and stereotypes. In reality, 98% of the people wearing turbans in the US and Canada are Sikhs, not Muslims. It is important to note that turbans do have significance in Islam, and vary greatly by region and sect. There are significant differences in color and style that distinguish kaffiyehs, the headgear worn by Iranian Mullahs, and the turbans worn by the Taliban in Afghanistan. To read more about the stereotyping of Sikh’s in the US, click here. I hope this blog clarified my thoughts on wearing traditional dress while traveling. Further, that it illuminates the difference between costumes and cultural immersion. The next time you find yourself in a far-off land, seek out some traditional clothing. Ask the shopkeeper about how to wear it and build the conversation from there. In my experience, wearing cultural dress is one of the best ways to have respectful and meaningful experiences with people around the world.